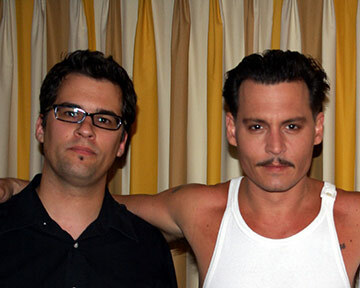 Myself and Johnny Depp on the “Public Enemies” shoot. I’m a 3D artist living in Ottawa, Canada. From a young age I’ve pursued my passion for visual effects, film and video games. Initially this lead me into art. I achieved a Bachelor of Fine Arts degree from Sir Wilfred Grenfell College in Newfoundland in 1998. The next stop was Ottawa, and the start of a long career in 3D scanning, animation and visual effects. My first experience with 3D graphics and technology was as a scanning technician with Arius3D. We used their proprietary tri-colour laser technology to scan museum artefacts and products at extremely high resolutions and in full colour. My next project was partnership in XYZ RGB, a full service 3D scanning bureau catering to the motion picture and video game industries. I filled the role of CTO and was in charge of organizing and overseeing scanning shoots at locations all over the world. In addition I became an expert at all types of 3D acquisition equipment including laser, structured light, high density stereo, and the unique rigs and complex camera arrays created by myself and my colleagues. During this time I also became a talented hologram artist, developing large format colour 3D displays for a variety of clients and film promotions. Some project highlights were The Matrix sequels, King Kong, Lord of the Rings, Tron Legacy and a long list of other films and video games. Next I made the leap to a creative role in games as a member of the art team on the XBOX 360 title “Madballs in: Babo Invasion” at Playbrains. Here I honed my skills in modelling, lighting design, concept art, environments, shaders and particle effects. Soon after I filled the role of Creative Director at Telesto, an e-learning company and full service digital agency. Here I managed the art team while still filling a vital production role. I acted as lead 3D animator, compositor and video editor and was also responsible for audio recording, sound design and music production. Here I also continued producing huge, animated holograms for movies like Pirates of the Caribbean: On Stranger Tides, Terminator Salvation, and Kung Fu Panda 2. I’m currently operating as an independent contractor and have recently concluded work on ‘Godzilla’ and ‘X-Men: Days of Future Past”. In my spare time I work on my music interests, improving my skills in guitar, bass and drums; as well as my interest in recording and mixing music. I’m currently working on a 3D animated short called “Overdrive”, and with The AK Project on their new album artwork and designs.